Ok full disclosure here. Until last night I had never seen an episode of Miami Vice. Sure I was familiar with it. Hell to this day I appreciate the fact that 5 o’clock shadows were made popular by it as I hate shaving. Now before you judge me keep in mind I was a little kid, so a crime drama was not really my thing. I always saw the commercials, the ads, heck I remember all the soundtrack albums that came out to go along with it but I never saw the show. 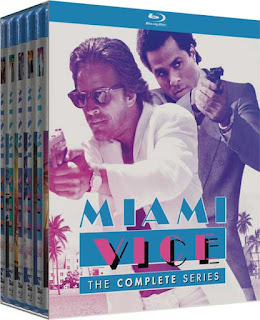 So last night I decided to pop in the Miami Vice complete series blue ray set, and once again I must thank insomnia because I ended up watching about 5 episodes. For the few out there like me who have never watched it, it centers around 2 Miami Vice cops named Crockett and Tubbs. They masquerade as drug dealers, who run the product off of Crockett’s cigarette boat. I dig the fact that the cigarette boat back them was an amazing speedboat whereas now they are everywhere. Crockett, played by Don Johnson lives on a boat that is guarded by his pet alligator. They set up scores as buyers and sellers to bust drug dealers. Its all set to the gorgeous back drop of Miami in the 80s, which in all honesty is where allot of trafficking took place. Most of these meetings take place in the hot clubs or on the beach. The 1st episode is the 2hr pilot showing how they meet, become friends and team up. We get introduced to the captain, the other cops, Crockets soon to be ex-wife, even his pet alligator. After that the episodes I watched featured a lot of the same plot. In part 2 they were after a crocked FBI officer, they went after an arms dealer (played by Bruce Willis), a racketeer, and of course more drug dealers. Even the main drug Dealer from the 1st episode returns. Even though things are referenced this was before the era of linear television, so if you miss an episode here or there you were ok as they were self-contained for the most part. One thing that stuck out was how the show looked. It was like Neon Film Noire. Everything was bright, paisley, shark skin, pink, peach, white, blue, every color of the rainbow. If there wasn’t a synth score playing in the background it was usually pop music from the biggest bands in the 80’s Everyone looked cool, acted cool, and dressed like they were going to a high rollers club. In essence the show looked really slick. Now I am saying it looked slick in 2016, I can see why it was considered so cutting edge back in its day. I give props for these Blu Rays keeping the original music. When 21 Jump Street came out a few years back on home video they could not get music rights and the episodes lost something because of it. The presentation on this set is flawless. Great picture quality, which considering the majority takes place outside is great as usually outside shots are hard to fully clean up. The sound is excellent and blasts through the speakers. Sometimes its too good as I had to keep turning down the score only scenes then turning it back up for the talking scenes. I like once again how it’s a nice standard blu ray case inside a standard cardboard slip cover case. Sometimes cheap packaging can ruin these sets, but Mill Creek did a great job on this one as well. If you, like 90% of the population are a fan then this is a must own set. If you have never seen it before like myself and the other 10% of us I recommend picking this one up. These are full shows not the edited syndication versions and they have the original music. It’s a great throwback to the loud colorful world of the 80’s, a decade that I wish would come back because after watching 5 hours of this I feel the need to go and buy a white pair of pants and a peach colored jacket. It would work, as I haven’t shaved in 3 days anyway. Overall 3.5 out of 5 stars! !